Mercedes-Benz has released a new teaser video that shows its upcoming all-electric SUV. The Electric car (SUV) which has been teased will be shown in the concept form at the on going Paris motor show. The teaser is partial and reveals only the front end of the concept car with the interior details. The front fascia of this Electric car fully appears to be completely made up of illuminated elements, and similar illuminations continues through out the car as well. Except the teaser, no other details are available currently. We already know that Mercedes’ electric-vehicle range would be badged EQ; so following the carmaker’s existing nomenclature, the electric SUV concept will likely be called as EQG once it reaches production. It is important to note that Mercedes has trademarked both, EQ and EQG, as well as other names based on their existing model range – names like EQ Inside, EQ Boost and Generation EQ etc. 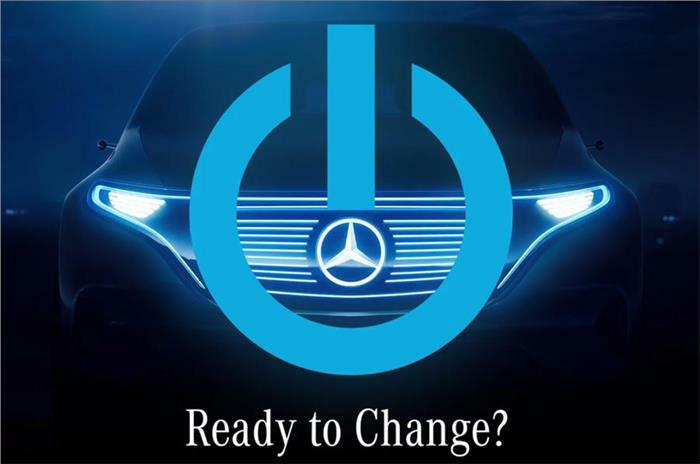 This could be similar to Volkswagen’s EV concept, which also will be demonstrated at the Paris motor show, The first ever all Electric car from Mercedes is scheduled to go on sale in international markets in the year 2019. The concept car from Mercedes is claimed to provide a greater insight into how the interior and exterior of car would look upon the release. The other rivals of Mercedes like Jaguar as well as Audi are also said to be working on all-electric SUVs, which would undoubtedly rival the EQG when it goes for sale. Meanwhile, the other core competitor BMW has long been rumoured to be expanding its sub-brand into the electric SUV market as well.